Cornerstone Legion Baseball of Albion made a deep run into the American Legion Juniors Class B Area 5 district tournament this past week, advancing to the championship round by winning an 8-7 thriller over host Aurora Monday night. After opening the tournament with a victory over Pierce Thursday, July 14, Cornerstone dropped a 7-6 heartbreaker to O’Neill the following night and was forced to take the hard route through the double-elimination event. The local Juniors came back with clutch victories over Central City Saturday and Area 5 #1 seed Wayne Sunday to reach Monday’s playback bracket final. The victory over Aurora puts Cornerstone in the district championship against unbeaten O’Neill. A berth in the Class B American Legion Juniors State Tournament at Beatrice (July 23-27) was to be decided Tuesday night, with Cornerstone needing to post two victories over the Irish to claim the Area 5 title. Cornerstone took an early lead in its tourney opener, saw Pierce rally to tie the score, then used three runs in the later innings for a 5-3 victory at Aurora’s Mitchell Field July 14. Cornerstone let a lead slip away with some late-game mishaps Friday and dropped to the playback bracket with a 7-6 loss to O’Neill. There was no hangover for Cornerstone following the tough loss, as the Albion Juniors bounced back to thump Central City 16-5 Saturday. Despite another contest in brutal mid-summer heat, top-seeded Wayne and Cornerstone played solid, exciting baseball Sunday with the Albion Juniors staying alive on the strength of a 4-3 victory. Another elimination game, another one-run victory. 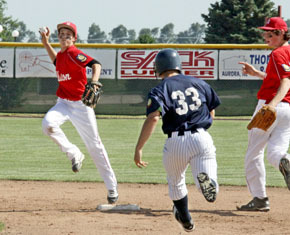 The Cornerstone ‘Cardiac Kids’ did it again Monday with an 8-7 decision over Area 5 tournament host Aurora. Game Details in Print & Online Editions of Albion News.